About 75 miles (160 kilometers) southeast of Johannesburg an extraordinary sight appears. Rising suddenly out of flat, maize-growing country soars an assembly of distillation columns, cooling towers, gasifiers, reactors, tanks and pipes running in all directions. This plant is doing something no other country has even attempted – producing petrol, diesel and hundreds of petrochemicals from coal. The plant and its nearby town are called Secunda, Latin for "second". The plant is owned and operated by Sasol (an acronym for South African Synthetic Oil), an international producer of chemicals, fuels, gases and lubricants. "Second" implies a "first", the first being Sasolburg, an industrial site and town developed on a coalfield 50 miles (80 kilometers) south of Johannesburg 50 years ago. That was when South Africa decided to use a German technology, the Fischer-Tropsch process, which had been patented 25 years earlier but never used on a commercial scale. The motive behind the formation of Sasol was to use a natural resource, low-grade coal, for which there was little other use, to develop a new industry and thus create jobs, lower the import bill and reduce dependence on foreign supplies of crude oil. The technical challenge was enormous. The total process is complex and highly integrated. Breakdown at any stage of it therefore threatens the whole, and that happened often in the early days. Because commercial application of the process was being pioneered, key plant components such as gasifiers and reactors for creating hydrocarbon molecules had to be designed from scratch. Nerves became frayed because Sasol was not allowed to pass the costs of its mistakes on to the public. Its petrol price could be no higher than that laid down by the South African government for ordinary petrol. Yet the capital investment required by the overall process was far higher than that needed for refining crude oil. From its earliest days Sasol was involved in researching and developing the design of its plant, the catalysts used in its reactors and how to get maximum value from the gaseous product emerging from those reactors. By the 1970s, when world oil prices started soaring, it had improved its operations sufficiently to feel confident it could conduct them profitably on a scale twenty times greater than it had at Sasolburg. Then it was decided to launch Secunda. The first of its production "trains" (lines) came on stream in 1980. Today, they meet almost 30 percent of South Africa's motor fuel needs and 90 percent plus of chemical feedstocks, while producing an attractive return on their capital investment. The success of the south African chemical company Sasol has not been achieved easily. Over the past 20 years the oil price, which determines Sasol's petrol price, has fluctuated dramatically. For some years Sasol received government finances and protection against the heaviest dips in the oil price. But the company realized that it could not rely on that protection lasting indefinitely. Ways would have to be found to produce hydrocarbon molecules more economically – and to recover from the product stream emerging from its reactors – chemical compounds that would fetch far higher prices as feedstocks for plastics and other industries than they would as fuel components. To exploit these opportunities, two different types of reactors for two temperature ranges were needed. The reactors, designed particularly for Sasol's applications, suffered severe teething problems. molecules are unique to the Sasol process; they are not found in crude oil, so new ways of separating them out had to be found. Sasol met all these challenges, either on its own or in collaboration with engineering contractors, technical consultancies and researchers at local and foreign universities. They developed an in-house research and development team that includes hundreds of graduate scientists and engineers. It also became skilled at working with other organizations, using their technical knowledge or research capability. Sasol's hard-won ability to extract many different chemical compounds from its reactors' product stream, compounds that others obtain only through further processing, led to its becoming a significant global player in petrochemical feedstocks. "We realized we had a fundamentally competitive feedstock, despite the tremendous disadvantage we have in major world markets produced by our great distance from them," says Sasol's chief executive, Pieter Cox. "And we set out to exploit it." They did so by forming joint ventures and making acquisitions. 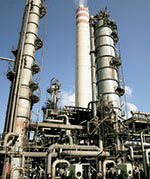 Sasol's biggest acquisition, made in 2001 for 1.2 billion U.S. dollars, was the German chemicals group, Condea. "It has given us a world-leading position in our niche areas of solvents and surfactants," Cox says. The development in recent years of a far more productive slurry bed low-temperature Fischer-Tropsch reactor than that based on the catalyst-in-tubes concept will also see Sasol competing in world fuel markets. Two large schemes to produce high-quality, low-emissions diesel from natural gas are being implemented in Nigeria and Qatar. Representing a technological partnership between Sasol, the oil major Chevron and the Danish process equipment company Haldor Topsøe, they will come on-stream in 2005 and 2006 respectively. The conversion of natural gas to liquid fuels (known at Sasol as GTL) presents logistical challenges. The price of the gas has to be low to make the end product competitive, which means that the gas should have no competing use. That, in turn, means the gas fields must be far from industrial and domestic markets; the plant must be assembled and operated in remote areas. Nevertheless, Cox is upbeat about GTL's global potential, even without the possibility that the process could produce petrochemicals as well as diesel. "Chemicals and fuels will be equally important to Sasol's future growth," he says. Both will continue to depend on technological innovation, and partnerships formed to pursue it. "The message I keep giving our people is that this is not a journey with an end in sight," Cox says. "As we achieve the big challenges of the day, new ones emerge. Where originally we were fighting challenges, today we're fighting opportunities." Technological partnerships are raising Sasol, South Africa's fuels and chemicals company, into a significant global player. Because temperature control is crucial to Sasol's operations, it uses about 11,000 heat exchangers. It recently launched a program to investigate that investment. "More efficient heat exchange means higher production," says Arnold Benade, technical advisor for commodity management and mechanical equipment. Operating conditions are difficult. Apart from high temperatures and pressures, the water passing through Sasol's heat exchangers is heavily contaminated. That explains why about 80 percent of Sasol's heat exchangers are of the shell-and-tube type; historically, they have been seen as the best alternative. Sasol has, however, used Alfa Laval plate heat exchangers since the mid-1950s. Originally these were of the conventional gasketed type. Recent heat exchanger innovations, and a growing understanding of the benefits of compact heat exchanger technology, have resulted in Sasol purchasing more new heat exchangers from Alfa Laval, covering applications at higher pressures and with phase change in the fluids handled. For example, for the acrylic acid and acrylates plant under construction at Secunda, the contractor Foster Wheeler has ordered 11 Compablocs (welded construction), 12 spiral heat exchangers and 4 spiral reboilers. Many more cases are under consideration on Sasol sites, where traditional shell-and-tube technology may more cost effectively be replaced by Alfa Laval compact heat exchangers. Alfa Laval has always performed service of its equipment, but for some years on an ad hoc basis. The relationship between the two companies strengthened during the 1980s, says Benade's colleague, Fanie Nel, when Sasol realized it would be more economic to contract out maintenance of plate heat exchangers. "Alfa Laval had greater expertise and better equipment than we did," he explains. "Eventually, Alfa Laval began offering technical advice too, solving many problems for us." In the 1990s, Sasol launched its Net Gain program, aimed at minimizing the total cost of owning and operating plants. The valuable relationship that had developed with Alfa Laval persuaded Sasol to look more broadly at its plant and ask whether other manufacturers' expertise, especially their greater knowledge of the latest developments in technology, could not also be put to greater use. "Knowledge leverage is the answer to minimizing the total cost of ownership over the lifetime of a plant," Benade says. To achieve this, Sasol creates "value teams" that work with outside experts in a particular field for three months. Each team works on how to maximize Net Gain within its specific field. The value team for heat exchangers recently completed its task, says Benade, and has passed its decisions to a commodity management team for implementation.